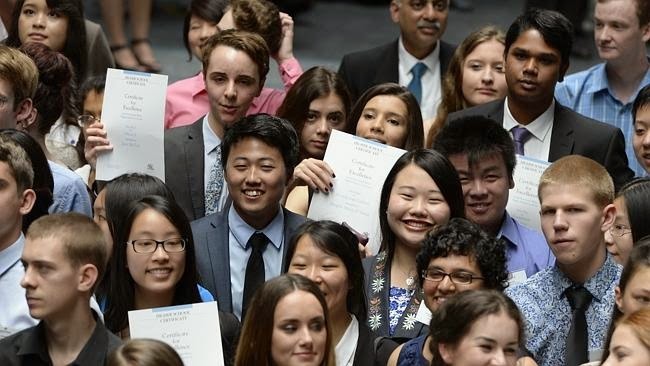 Paradoxymoron: Did Girls And Asians Dominate HSC Results This Year? Pretty Much. 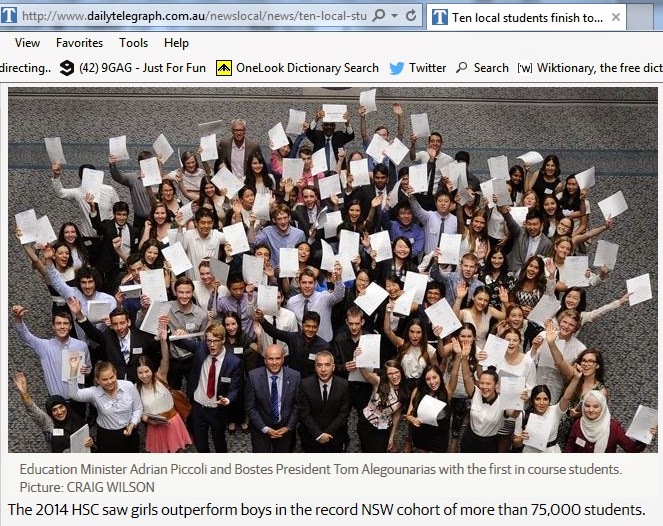 Did Girls And Asians Dominate HSC Results This Year? Pretty Much. Back in mid-October, I made a few observations about successful HSC results over the past 13 years, and noted how certain demographics seemed to make regular appearances in certain subjects, despite the marking process being one of relative anonymity with all students assigned an arbitrary ID number for a fair marking process. - Out of around 800 high schools spread across 809,000km² of New South Wales, 47 out of the 50 top performing schools in 2013 all came from within a 3,000km² area of urban Sydney. - Despite 5% of Australia’s population being Indigenous and <4% of Australia’s population being of Chinese heritage, Indigenous students rarely appear at all in lists of academic distinction, whereas Chinese students appear in the Distinguished Achievers disproportionately higher compared to all other demographics that take up a similar percentage of the Australian population. - There are certain subjects each year which display a notable gender dominance in First In Course results, both involving vast disparity in enrolment and relatively equal enrolment. - The Top 7 high schools of 2013 were all selective government schools with a non-English speaking (predominantly Chinese) population of 97%, 94%, 88%, 90%, 90%, 82% and 90% respectively. - Rich private schools around the inner city with predominantly Catholic and South African/Jewish populations also perform consistently well in HSC results. A high ICSEA rating (around the 1200 mark) tends to link with highest scoring results. - A smaller though noteworthy number of schools with high Indian attendance also perform well in the HSC, despite Australia’s Indian population being significantly smaller than our Italian, Greek, Arabic, Serbian, French, Spanish, German, Macedonian, Croatian, Polish and Turkish-speaking populations. 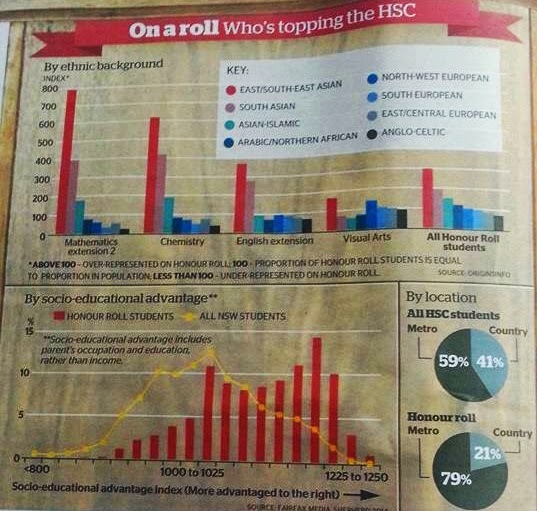 - Girls and Asians generally dominate HSC results. For 2014, the trends stayed generally the same, with 67 girls attaining First In Course wins compared to 38 boys, continuing the academic dominance of girls in recent years. With apparently 75,000 students enrolled in HSC subjects this year (I assume accelerated single-subject Year 11 students were also counted) it was a very large playing field indeed. My prediction: Never, ever ever, a boy or an ethnic. 2014 Winners: Three different White girls. My prediction: A White girl from the Northern Beaches named Amelia. 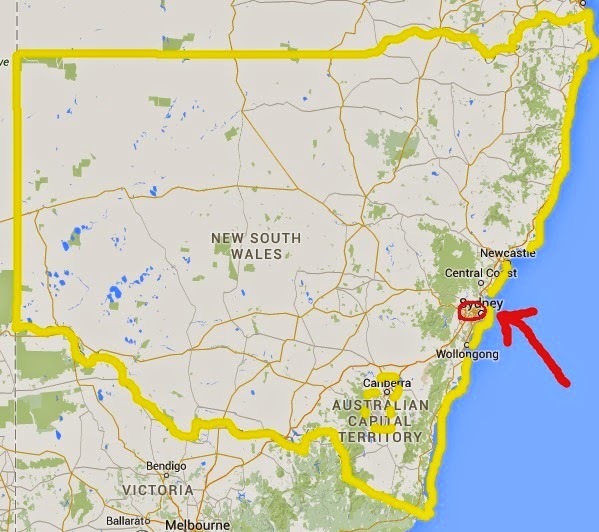 2014 Winner: A White girl from Byron Bay named Annabelle. My prediction: Never, ever ever a boy. Girls have won 13/13 years despite 25-33% of enrolments being boys. My prediction: A White girl from a rural school. Twice as many boys take PDHPE than girls but 12/13 wins have been girls. 2014 Winner: A White girl from Parramatta. My prediction: Never, ever ever, a boy.2014 Winner: A girl. My prediction: With 30,000+ students of all demographics, I lean slightly towards a girl, and a 1-in-a-thousand crack at Pymble. 2014 Winner: A girl from North Sydney Girls High School. 2014 Winners: Doulakis, Kefalas and Vallis. My prediction: Never, ever ever, a girl. IT WILL BE A BOY. My prediction: A White boy from Moriah College. Almost 94% enrolment in SD&D is male. 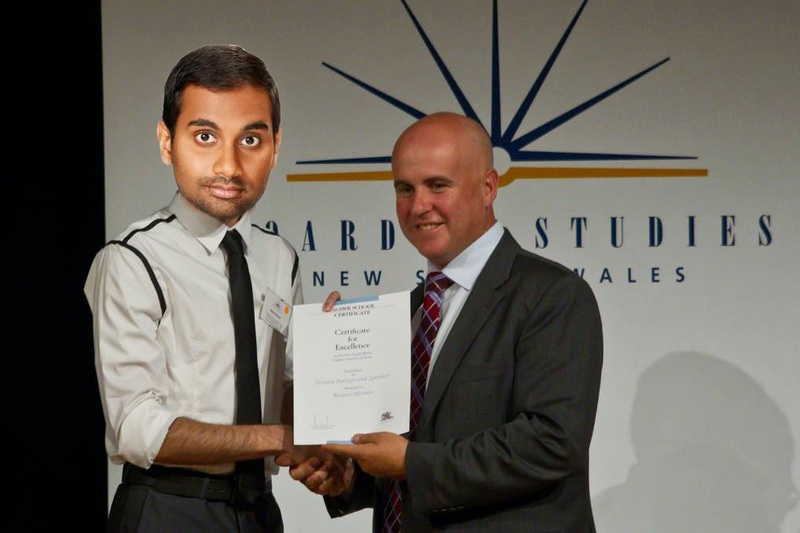 2014 Winner: A White boy from Normanhurst Boys High School. My prediction: A random name from a school you've never heard of before. 2014 Winner: Spiros Kalavritinos from Georges River College Oatley Senior Campus. My prediction: A White boy from a random bogan school. 2014 Winner: A White boy from a random bogan school in Ballina. My prediction: An Eastern European girl. Damned if she doesn't have a Croatian/Serbian/Czech/Russian sounding surname. 2014 Winner: A girl with a Portuguese surname. My prediction: Eastern European Whites all around. 2014 Winners: A White girl for Beginners. An Eastern European White boy for Continuers and Extension. My prediction: [comment amended in sensitivity of recent events in Sydney] A convoluted Arabic surname like Valizadeh Baghjeghaz, Arjomand Bigdeli, Vafaeiafraz or Darvishzadehzolpirani. My prediction: A Chinese girl from James Ruse Agricultural High School. 2014 Winner: A Chinese boy from Hurlstone Agricultural High School. 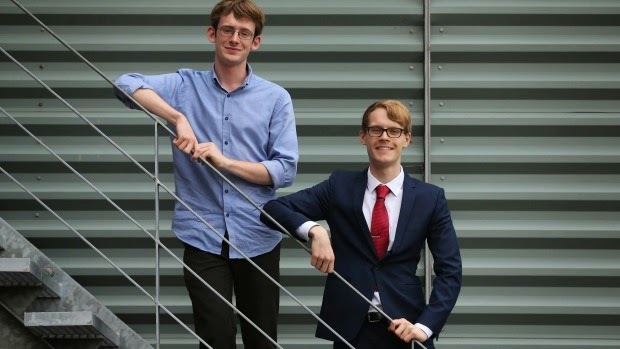 My prediction: Chinese students from James Ruse with a White first name and ridiculously Asian surname, or a A White boy from Sydney Grammar. 2014 Winners: Paul Yu for Mathematics, Michael Sun from James Ruse for Extension 2. BIOLOGYMy prediction: Abbotsleigh has beaten James Ruse for Biology 4:3 so I say Abbotsleigh. My predictions: A White boy from a private Sydney Catholic school for Ancient. Either a White girl from North Shore or Chinese girl from a Girls’ School for Modern. A White girl from a random rural school for Extension. 2014 Winners: A White girl from a random rural school for Ancient History. A White boy from a private Sydney school for Modern. A Chinese girl from a Girls’ School for Extension. My prediction: A Vietnamese or South Korean girl at a Western Sydney school. 2014 Winner: A Filipino girl at a Western Sydney school. Two White boys clocked up 9 First In Course wins between them this year. As you can see towards the end there, my predictions became a little less accurate... and the numerous *omitted* predictions from hereon would display that several past trends were wildly overthrown, such as the first male Visual Arts win in a decade and the notable spike in Indian names this year. Speculative jokes can only go so far and attempting demographic pigeonholing based on gender, race and socioeconomic location is evidently a flawed exercise. Best of luck with your tertiary pursuits, students!